The following is all information I covered before here, back in the Warlords of Draenor Beta, when tier 17 set bonuses were finalized. 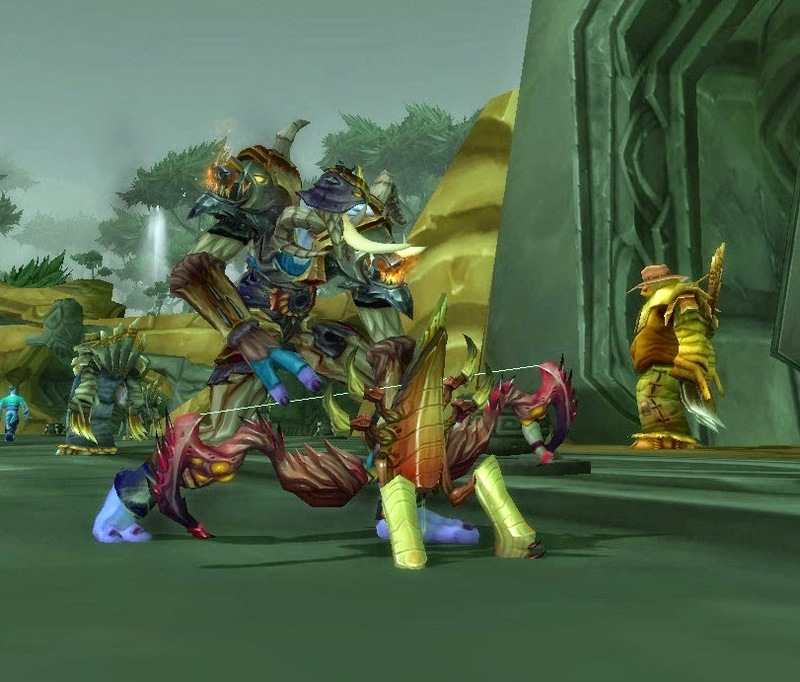 I've seen the subject come up again on the battle.net forums, and the MMO-Champion hunter forums, so I thought it might be worth going over again, as many of us are getting our 2 or 4 piece set bonuses in the live game. (2) Set: Kill Command has a chance to reset the cooldown of Bestial Wrath. (4) Set: While Bestial Wrath is active, one additional pet is summoned to fight with you. I'm not sure if someone has datamined (or actually done the work testing) the PPM or RPPM rate for the 2 piece set bonus, but most BM hunters are averaging Bestial Wraths once every 40 - 50 seconds with the 2 piece. With the very best RNG, a few hunters have parses with up to 30% up time on Bestial Wrath (which is about 2 casts per minute). However, as with all things RNG, sometimes you may go through the entire cd of BW without getting a reset, and sometimes it may reset on the first Kill Command you cast after popping BW. This is going to make Beast Mastery just about as reliant on RNG as Survival has been in 5.4, especially once we get to the Focus Fire buff of 6.1; however, there are a few things we can do to manage some of those quick resets, and make sure we're prepared to get the most DPS out of them. The first question that was brought up to me, is should we use the second BW immediately, before the first is over. I imagine the line of thinking here is something like: if we wait until the end of of BW, then we might miss a reset, because BW will be off CD already. So let's take a look at how that would compare. 16 sec - Bestial wrath ends. Here we actually did get an extra 2 seconds (we would have only had 20 seconds, again, had we waited until BW were finished to re-cast it). If we continue to play this little game, and look at all the various options on which KCs reset BW, you'll find most of the time, you're going to get 4 or 8 extra seconds of BW by holding off on casting it until the BW that's currently up is over. But, there certainly are some situations where that's not the case, and you'll gain 2 or 4 seconds of BW by always assuring BW is on CD before casting a KC. The vast majority of the time, you won't have to deal with this issue at all, and it's incredibly unlikely that you'll end up with 3 resets in a row. In general, it'll be best to hold off on casting BW until the previous BW is over. On the rare chance we do get multiple Bestial Wraths in a row, we have a new set of problems. The traditional advice for dealing with BW, is you should pool focus leading up to when BW comes off cd, so when you cast BW, all you have to do is hit KC and AS (and Kill Shot, if it's that time in the fight). This is still just as true in WoD as it's been in MoP (with exceptions for barrage and Glaive Toss). Using BW while you're low on focus, means you're buffing cobra shot (or focusing shot, if you swing that way), which just, well, isn't what you want to use your buff for. What I found produced the best results, was holding my second BW even longer, hitting a couple of Cobra Shots (and, if applicable, focus fire), then popping my second Bestial Wrath. This allowed me to really get the most out of the Bestial Wraths. Furthermore, if you hit BW a second time right after the first one ends (and you started the first one right before hitting a Kill Command), you'll only just barely have time to get a second Kill Command into the second BW. If you end up running low on focus, and need to use Cobra Shot, you may push the second Kill Command out of the BW buff. The benefit of using a couple Cobra Shots before reapplying BW, is you will then be reapplying it right before your Kill Command, insuring you'll most definitely get two into both Bestial Wraths. Because Barrage has that super high focus cost, it can be a bit difficult to use without delaying your Kill Command. You can basically negate that problem by casting it during BW, bringing the focus cost down to a much more managable 30 focus. What I've found gets the most out of my BWs, is hitting my normal Kill Command and Arcane spam, and then on the very last GCD of BW. This gives you the low Focus cost on Barrage, but doesn't risk that you'll use up too much Focus during BW, and potentially lose time to having to cast cobra shots. While I'm not excited about the RNG issues with Focus Fire, I do enjoy managing two major CDs. In MoP, Focus Fire was more of a Focus Regen CD, that you really just use during the dull points when you're going to cast a few Cobra Shots. Now, however, it has become a monster DPS CD. Starting in 6.1 that awesomeness will be amplified even more, as the 5% AP buff per Frenzy stack consumed is being increased to 8% per stack consumed. Without the 2-piece bonus, the best way I've found to use Focus Fire, is make sure you want to hold your frenzy stacks so you have five, 10 seconds before BW comes off cd. If you can use it 10 seconds before BW, then you'll have 10 seconds of increased focus regen, and 10 seconds for your pet to build back up a few stacks of frenzy, in addition to having the AP buff all the way through Bestial Wrath. With decent RNG, you'll have enough Frenzy stacks to use it again after BW, too. For more on why this is the case, click here. With the 2 piece set bonus, there's really no way to plan out your Focus Fire uses, since you, for the most part, have no idea when you're going to be getting your next Bestial Wrath, so you'll basically just want to cast it any time you get 5 stacks of frenzy, to ensure the most possible up-time. If you get a couple Bestial Wrath resets in a row, or if it resets while you have 5 stacks, it is going to be worth while to delay BW by a GCD to cast FF first, and possibly to cast a Cobra Shot or two, as I mentioned above. There's really not much going on with our 4-piece. It doesn't affect your rotation really. One consideration might be that because it will lose up-time when it bugs out, you'll want to switch targets before casting BW, but that's something we all should have been doing anyway. Back in the beta, Bendak over at Eyes of the Beast found the summoned pet wasn't doing any basic attacks, it was only doing melees. Which means we're not going to see much DPS out of it; it's a fairly lack-luster bonus, even if it is cool to see a second pet up there. With the huge rotational change in the 2-piece bonus, I think we'll be ok without getting much out of the 4-piece, though. The 4 piece on the ptr was doing quite a bit more than beta. I think it is about double of an individual stampede pet.